The Monarch No. 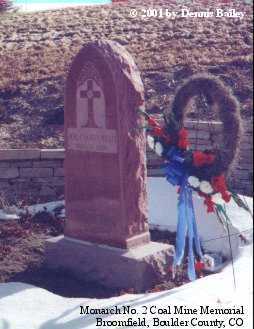 2 Coal Mine Memorial is located northwest of Broomfield, Colorado on the south side of U. S. Highway 36. Travel west from Denver on Highway 36 towards Boulder, Colorado from Interstate I-25. Go approximately 7 miles to the Broomfield exit. Travel another 2 miles to the Flat Iron Crossing West exit. The Memorial will be on you right, or west side of the road, along side the roadway just after pass over the creek. 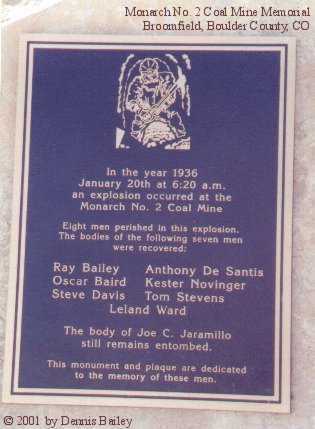 On January 20, 1936 a blast, believed to have been caused when a spark ignited coal dust, killed eight men working the night shift in the Monarch Mine No. 2. 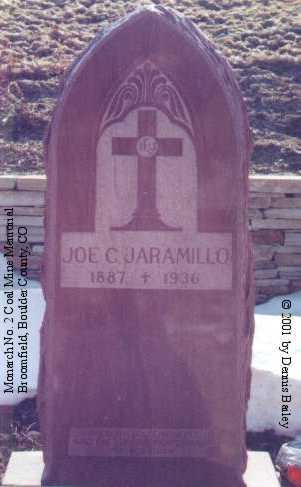 The body of mule boss Joe C. Jaramillo was never found. The theory is that Mr. Jaramillo was right at the point of the explosion when it occurred, explaining why his body was never recovered. Due to the dangerous nature of the search operation, the search for Mr. Jaramillo was called off and the company placed a granite gravestone at the entrance and permanently closed the Monarch No. 2 Mine. A development company purchased the land containing the memorial and the Flat Iron Crossing Mall was built on the land. The marker had to be moved to make way for a new highway exit. The developers built a 17-acre park named after the former land owner, Frank Varra, and relocated the memorial marker and headstone. 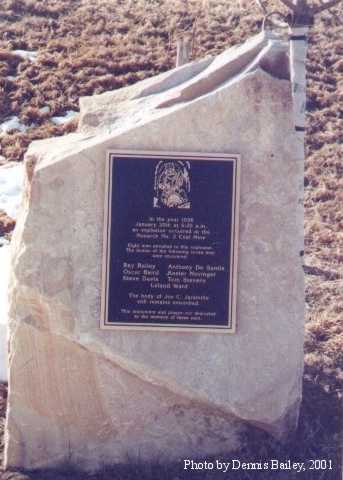 This park was dedicated June 27, 2000 and has been turned over to the City & County of Broomfield. Webmaster's note: On 15 Nov 2001 Broomfield County became Colorado's sixty-fourth county. Monarch No. 2 Coal Mine Memorial is located in within the boundaries of the new county. January 20th at 6:20 a. m.
Eight Men perished in the explosion. to the memory of these men.